When you can't decide on breakfast, have it all - a saying I live by. The other day, I decided to have raw crepes, raw buckwheat cereal, a smoothie, and a raw bagel with avocado mash for breakfast. Okay so maybe I haven't been entirely true to that statement lately-- I feel as though I've been dining majestically at all meals. But hey, who's to judge? 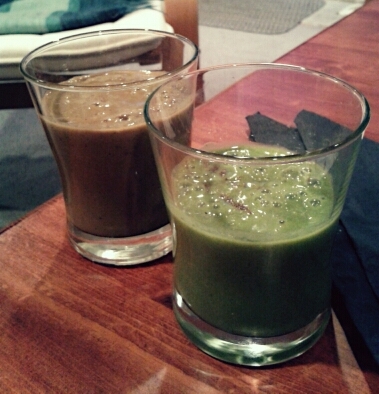 Either way, part of today's breakfast included some smoothies that I never thought of trying before. You see, usually when I think of smoothies, I think of loading in everything I can to make it the most nutrition-packed green goodness possible. I guess "keeping it simple" never crossed my mind, even though I've heard claims that the simplest smoothies are, in fact, the tastiest. Halfway through my blending this morning, I decided to pour out some of my original smoothie into a cup, and add a few more ingredients to the rest to test out a few new flavours. The verdict? Heaven. And for those of you who aren't completely in love with kale (yet) like I am, great news: You can't even taste it! Blend together, pour into glasses, and savour the deliciousness.